Christmas is my very favorite time of year to visit Walt Disney World. 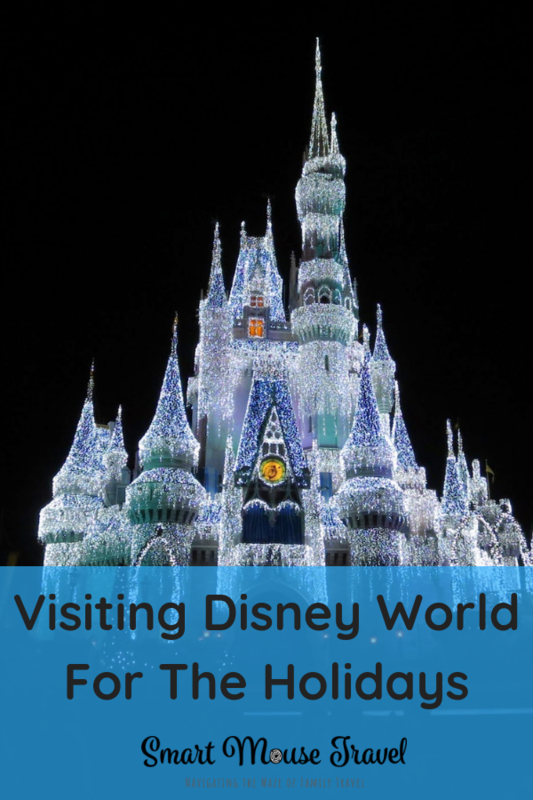 There is so much to do and see at Disney World at Christmas. The resorts, parks, and Disney Springs are fabulously decorated. There are also a variety of special Christmas events to experience. Here is some important general information about Disney World at Christmas and several of our favorite activities. I hope this inspires you to plan your own Christmas Disney World vacation. 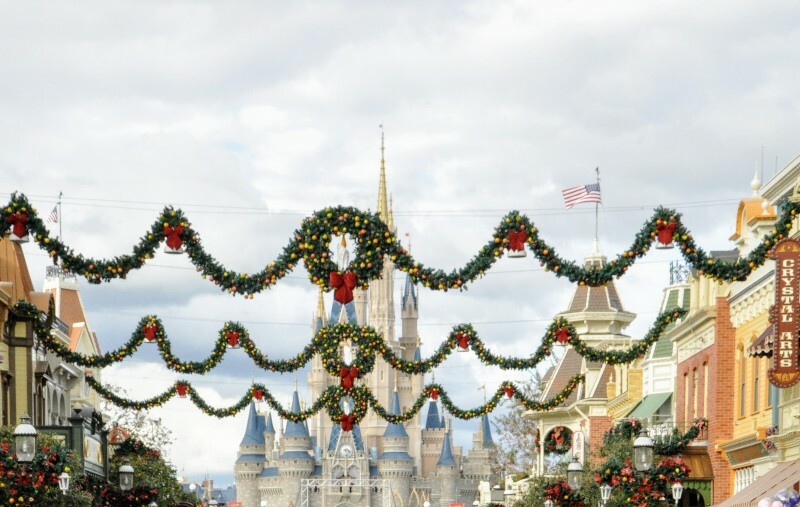 When Is The Best Time To Visit Disney World For Christmas? The best time to visit Disney World for Christmas is from a few days after Thanksgiving until about a week before Christmas. This time of year is busy, but not to the crowd levels of Christmas break. Mickey’s Very Merry Christmas Party, Disney World Christmas decorations, and the Disney Springs Christmas Tree Trail are usually available starting in early to mid-November. Some events such as Epcot’s Candlelight Processional often start on or just after Thanksgiving. 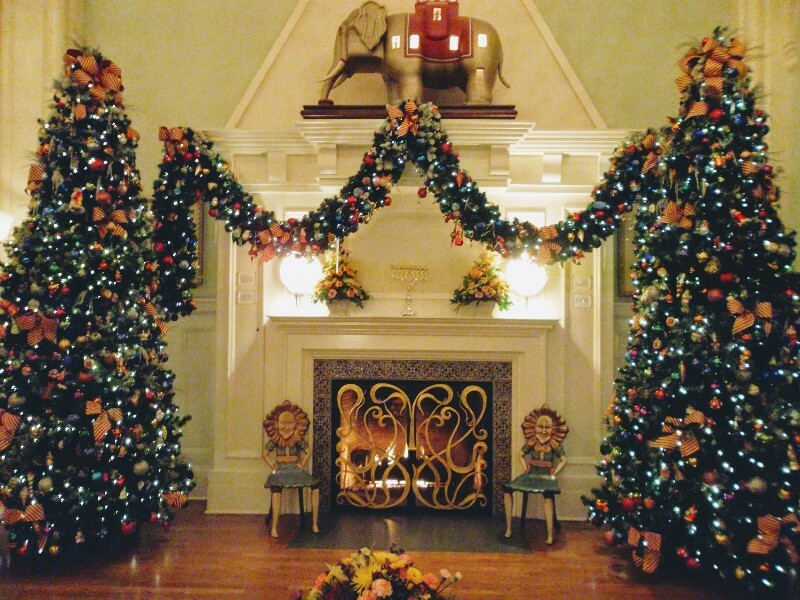 If you go before Thanksgiving you may miss out on some Christmas fun, but many of the decorations and several activities will be available. Our favorite time to visit Disney World for Christmas is during the first couple of weeks in December. 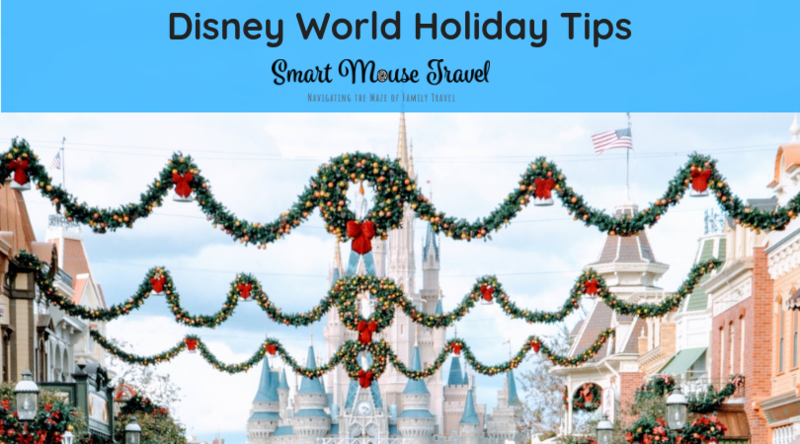 This way you can enjoy all that Disney World has to offer for the holidays with less crowds than closer to Christmas Day and the New Year. The two weeks from just before Christmas to just after New Years are some of the most crowded times of the year for Disney World. Sometimes the parks will even reach capacity. If a park reaches capacity it means the parks are so full that additional guests can not enter the park until others leave. Where Can I Find Disney World Christmas Decorations? There are Christmas trees, wreaths, and other decorations at all of the Disney World Resorts and theme parks. Disney World cast members put up an astonishing 1,500 Christmas trees around the property. Magic Kingdom, Epcot, Hollywood Studios, and Animal Kingdom each have an immense Christmas tree decorated in a theme matching the park. Disney World Resorts also have impressive themed decorations throughout the properties. Some of the Disney World Resorts even have amazing gingerbread creations that you need to see to believe. 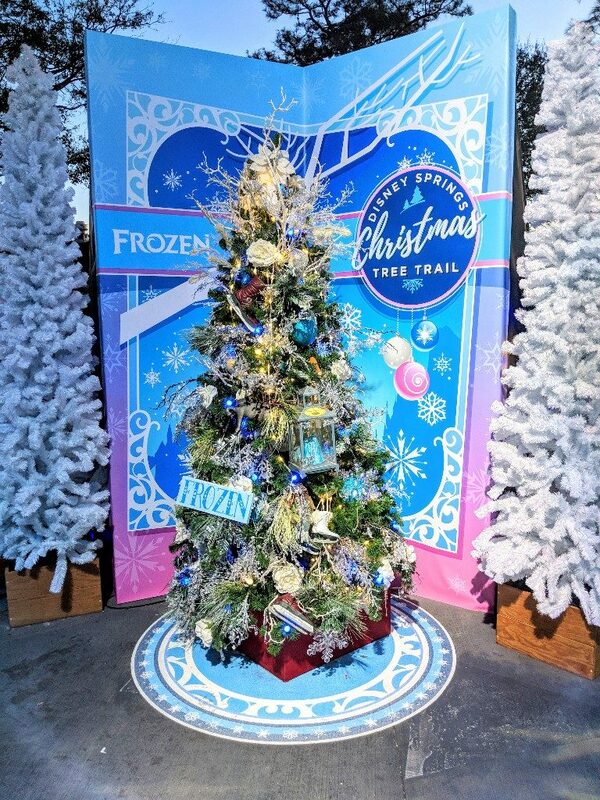 Disney Springs has the Disney Springs Christmas Tree Trail with dozens of specially Disney-themed Christmas trees in addition to usual decorations. The best part is that visiting the resorts and Disney Springs to see the Disney World Christmas decorations is completely free! Cinderella’s Castle is always impressive, but Christmas brings it to a whole new level. 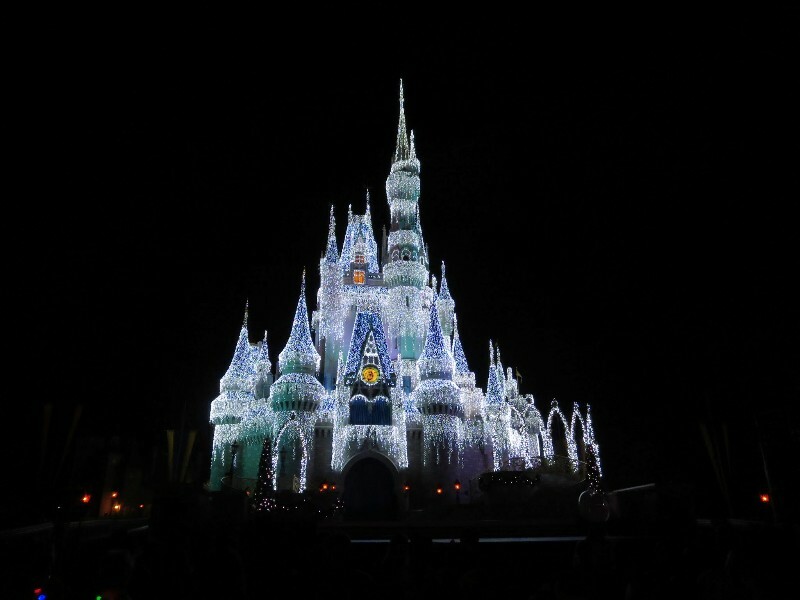 A Frozen Holiday Wish is a nightly show (or twice nightly on party nights) when the castle lighting takes place. This castle stage show features several Frozen characters and culminates with Elsa using her ice powers to turn Cinderella’s Castle into a glimmering ice palace. You do not need a Mickey’s Very Merry Christmas Party ticket to see A Frozen Holiday Wish. If you are at Magic Kingdom on a party night you can watch the castle lighting show and then exit the park. 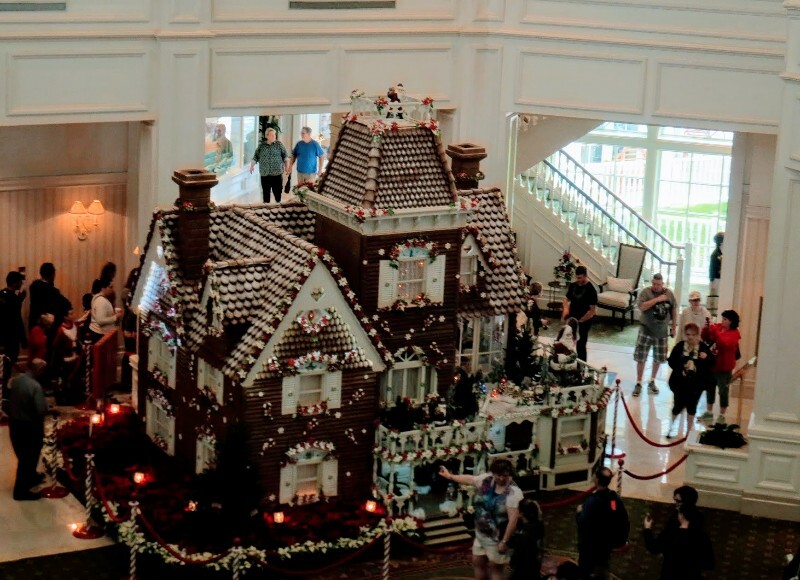 Disney’s Grand Floridian has the most impressive gingerbread house on Disney World Property. This immense 16 foot gingerbread house is found in the lobby of Disney’s Grand Floridian Resort. The minute you enter the lobby of the hotel you can smell the amazing gingerbread. There are stained glass windows in the house and beautiful detail all around it. One of the most unique things about this gingerbread house is that there is person working inside the house selling treats! 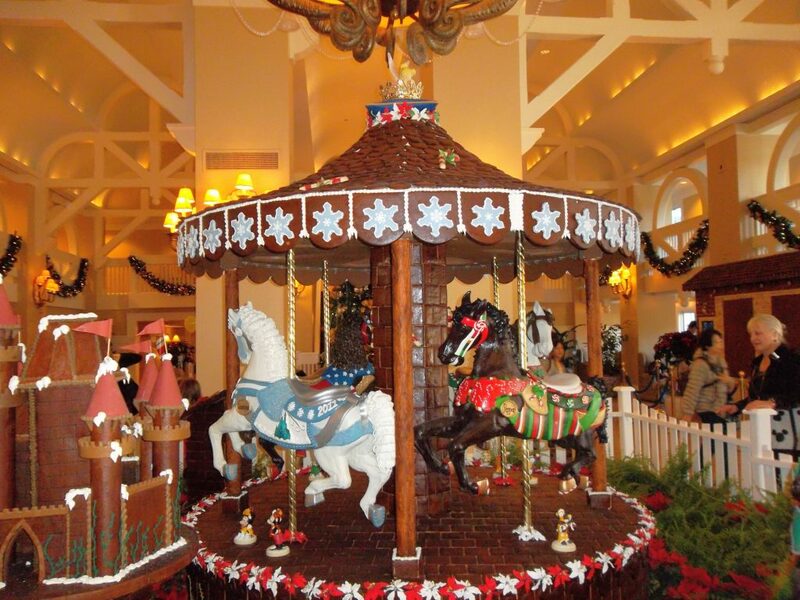 Disney’s Beach Club Resort has a working gingerbread and chocolate carousel. The horses are made of chocolate and much of the rest of the carousel is gingerbread. The carousel even rotates! 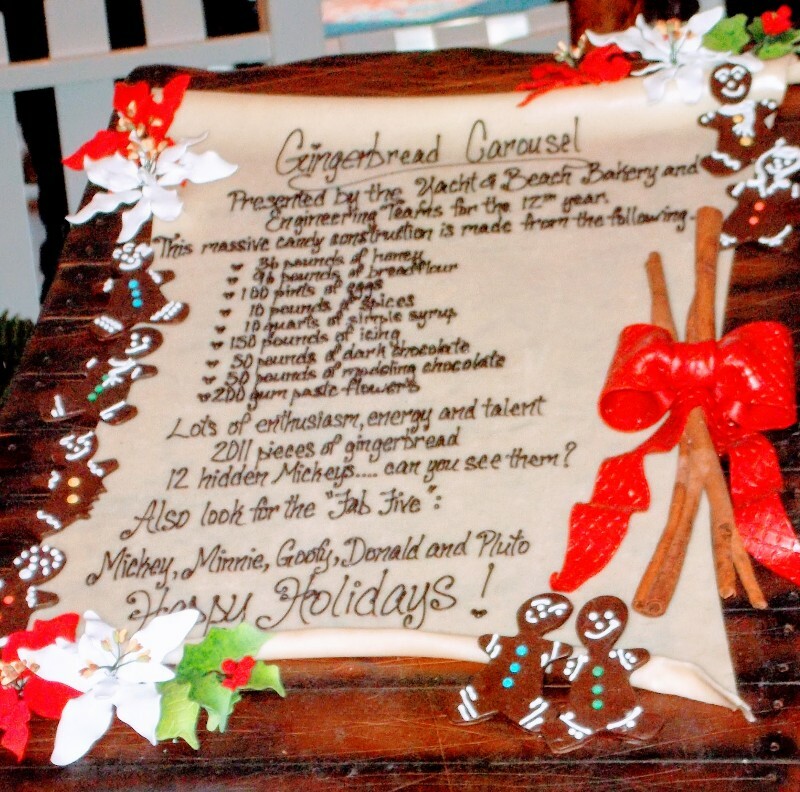 Each of the gingerbread creations at Disney World resort hotels will have a display near the gingerbread decoration. This display will show exactly what ingredients went into making the house, carousel, or other item. The quantities needed to bake these creations is unbelievable. Can you imagine needing 96 pounds of flour or 36 pounds of honey to do your baking? Most of these ingredient displays also show hints for how many hidden Mickey’s (or other hidden characters) you can find in the display. 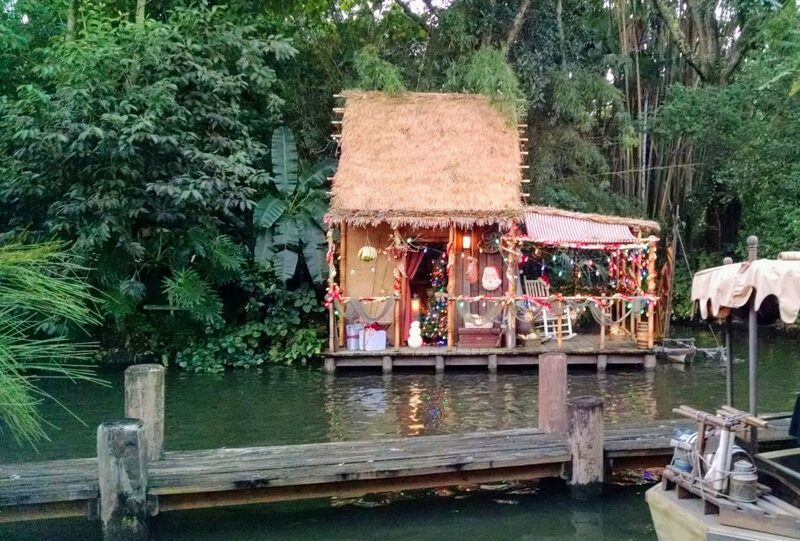 The Jungle Cruise gets a snazzy makeover to become the Jingle Cruise. The jokes don’t get any fancier for Christmas, but they do get some seasonal flair to go with the decorations. Disney Springs Christmas Tree Trail is a great (and free) way to celebrate Christmas at Disney World. The Christmas Tree Trail has dozens of special Disney-themed Christmas trees, occasional “snow” flurries, and music to renew your Christmas spirit on a rest day or when grabbing a dinner nearby. Mickey’s Very Merry Christmas Party is a fun seasonal event at Magic Kingdom. We enjoy the lower crowds, special parade and fireworks at the party. Find out more about this special ticketed event in my full review. We love Mickey’s Once Upon A Christmastime Parade. 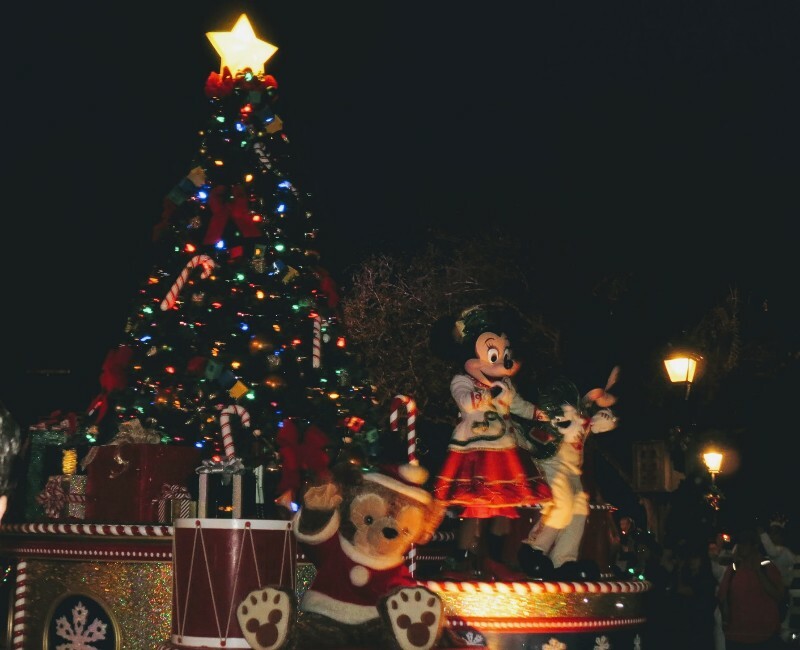 All of your favorite Disney characters dance and wave on special Christmas floats. In between the floats, performers entertain by dancing and interacting with the crowd. One of the best floats is Clarabelle Cow’s kitchen. Clarabelle’s float smells like fresh baked cookies as she passes. On the final float of the parade Santa wishes everyone a Merry Christmas. Speaking of cookies, during the party you have complimentary cookies and beverages at stations to keep you full of Christmas cheer. Please note: Although the official party time is 7 pm until midnight you can enter Magic Kingdom at 4 pm with your party ticket allowing you an extra 3 hours of magic! I do have to give a shout out to The Osborne Family Spectacle of Dancing Lights that was at Disney’s Hollywood Studios from 1995 until January 6, 2016. Gone, but not forgotten – we all still love to look at the pictures and watch videos of the light show. Christmas at Disney World is such a special time of year. The decorations and seasonal events make this a wonderful time to visit Disney World (if you choose your dates carefully). Arriving a few days after Thanksgiving, but before the holiday rush means you can experience the best of Disney World Christmas with less crowds. Did I miss any of your favorite Disney World Christmas activities? If so, please leave a comment on your favorite Christmas traditions at Disney World!